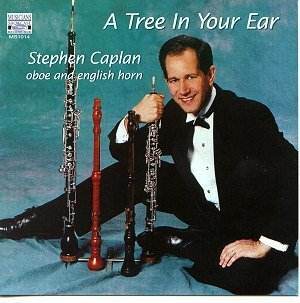 From his very first notes Stephen Caplan asserts himself as a subtle master of his instrument(s). A pupil of Ray Still and Harry Sargous Caplan is first oboe of the Las Vegas Philharmonic as well as being a leading light in Las Vegas' artistic life. Bimstein's Fantasy for oboe and taped frogs, crickets and coyotes is an American equivalent of Rautavaara's Cantus Arcticus (a fantasy for taped birdsong and orchestra) combining musical values with an image of time and place. New music but not a whit intimidating. Still's Miniatures have a keen-bladed poignancy in the hands of Caplan and Carol Stivers (piano). Nothing lasts too long and each of the five segments leaves you wanting more. The music itself is often unmistakably American but there are times when we seem to be listening in on a lost work by Howells or Goossens. The Hovhaness is characteristic of his Eastern world of water, fountains, bonsai trees, contemplation, miniature palaces, manicured wildernesses and time slowed to a crawl. A most affecting piece fulfilling one of the greatest needs of our times. It is close, at times, to Delius's music for Flecker's Hassan. Caplan is joined in the Hovhaness by John Beck (percussion) and Kim DeLibero (harp). The composer is the accompanist in Orpheus Singing - a work dedicated to Lutoslawski. Baley's long recitative is not that far removed from Thomas Wilson's music for the BBC adaptation of 'Cloud Howe' but it outstays its welcome as a piece of music. Lateef is best known in jazz circles. He rejects the name jazz abjuring its crude overtones and preferring the clumsier: auto-physio-psychic music! These blues are jazzy with piano, bass and drums each doing what you expect in a jazz context. Lateef plays by the rules. The oboe adds a pleasantly warm bluesy stratum. Mark Philips Sonic Landscapes is in five movements. It is for oboe and taped electronic music. This is the most challenging music on the disc although the oboe is always in melismatic melodious flight. The moods are Daliesque, pointillistic, alien, street junk culture and in the penultimate movement take us as close as we come in this work to the oboe's reflective realm. All oboe aficionados will want this disc. The only pity is that another one or two works could not have been found to fill the disc out to 70 or 80 minutes.